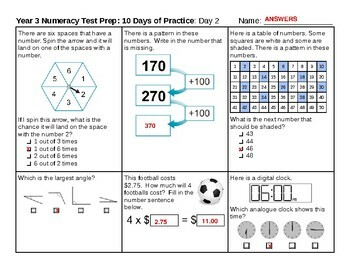 This is a 2-day sampler from my 10-day test prep / review packet for the Year 3 Numeracy Test. 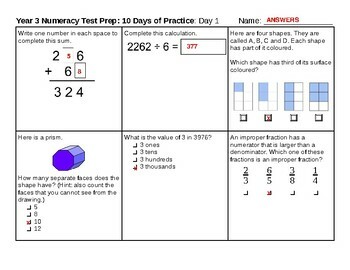 The 10-Day Packet covers a little bit from each standard and is designed to be given over 10 days. It includes adding, subtracting, multiplication, and division, decimals, fractions, bar graphs, etc. It can be used as math/numeracy centres, homework, in-class activities, or however it helps your kids. Download this 2-day sampler for free to see if the 10-Day packet will work in your classroom. :) The full 10-Day packet can be purchasedhere.